$1,749.99 each List: $3,230.00, You Save: $1,480.01! Balanced Action Pedal System: spring tension is used to change the pitch of the heads, and no clutch is needed. The pedal action is smooth, and a spring tension knob at the base of the drum allows you to adjust the tension so that the action remains smooth throughout the entire range of the instrument. Removable Bowl: with a flick of the lever on the base and a drop of the pedal, the bowl will easily separate entirely from the base. Maintained Tension: when the bowl is removed from the base, the tension still remains! Folding Base: with the bowl removed, the legs of the base can be folded back giving you a very compact package to carry. Double-Lock Wheels: the medical-grade heavy duty wheels on this instrument have double locks, meaning that they will neither roll nor swivel. Additionally, locking wheels next to the pedal make moving this cumbersome instrument as easy as possible. Height Adjustment: (bowl attached) by loosening a hex bolt on the base with the included key, the bowl can then be rotated on a threaded column, raising or lowering the bowl by up to eight inches. 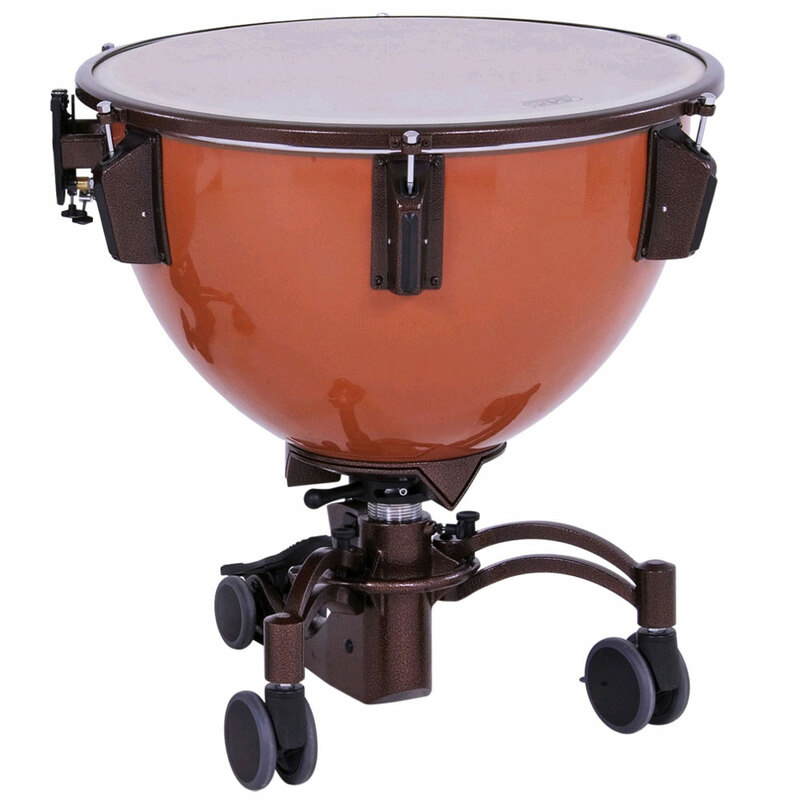 Fiberglass Bowls: lower in weight and less expensive than copper, fiberglass shells have a slightly shorter sustain that makes them ideal for smaller ensembles and venues.